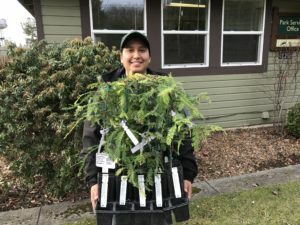 Below are 30 photos of the Puget Sound area parks professionals who are the recipients of more than 300 Archangel redwood saplings. Representing 30 different Puget Sound communities, they will be custodians of these trees in their parks for years to come. Judging by their smiles, they are happy to be placing these giants-to-be in their parks. 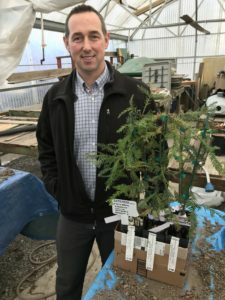 Five cloned redwood saplings were delivered to Eric Peterson, Lynnwood Parks Superintendent, on Jan 6, 2017. They will be planted in Lyndale Park on March 16, 2017. 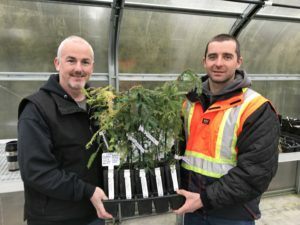 Tracy Bell, left, and Brad Cooper, Everett Park arborists, take delivery of ten redwood saplings for the City of Everett Parks and Recreation on Jan 6, 2017. 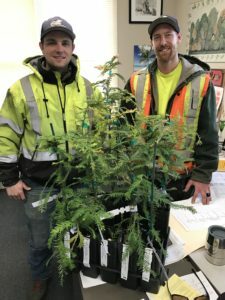 Derek Malone, left, and Zach Landgraf, Lacey Parks arborists, take delivery of ten redwood saplings for the City of Lacey Parks and Recreation on Jan 9, 2017. Lacey plans to keep these in their greenhouse for a year or more to increase their size before planting. Planting will most likely be done in Lake Lois Habitat Preserve and Wonderwood Park. Gary Cooper, University Place Director of Public Works, Parks & Recreation, takes delivery of ten redwood saplings on Jan 9, 2017. These trees will be planted in Paradise Park Pond natural area and Adriana Hess Wetland Park in University Place. 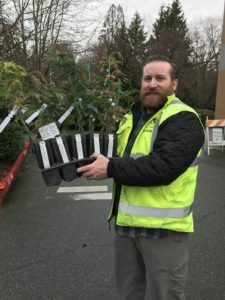 Aaron Milner, Bothell Parks arborist, takes delivery of five redwood saplings for the City of Bothell Parks and Recreation on Jan 10, 2017. Bothell plans to plant them on Arbor Day in April 2017. 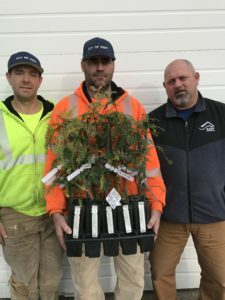 Mike Brundage, left, Todd Dow, center, and Quientin Poil, Kent Parks arborists, take delivery of ten redwood saplings for the City of Kent Parks, Recreation and Community Services on Jan 11, 2017. Kent plans to raise them in their greenhouse until they are a larger size for planting. 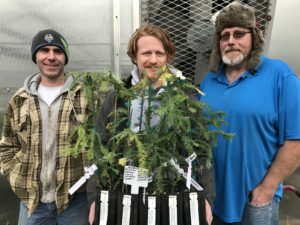 Richard Valenti, left, Trent Mannon, center, and Mike Miller, Auburn Parks arborists, take delivery of ten redwood saplings for the City of Auburn Parks, Arts and Recreation on Jan 11, 2017. They will be planted in Isaac Evans Park in Auburn. 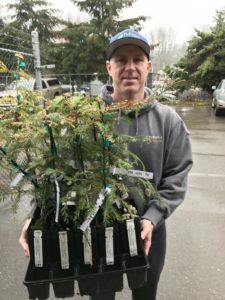 Rick Bailey, Forest Management Program Supervisor for Bellevue Parks and Community Services takes delivery of 30 redwood saplings on January 11, 2017. 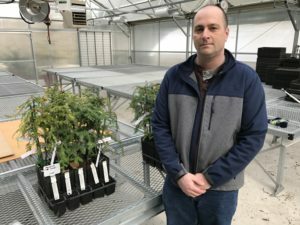 The saplings will be kept in the Bellevue greenhouse until they are planted in the Fall of 2018. 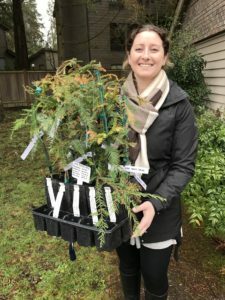 Alaine Sommargren, Natural Resource Manager for Mercer Island Parks & Recreation Department, took delivery of five redwood saplings for the City of Mercer Island on January 11, 2017. This photo overlooks the site in Luther Burbank Park where these trees will be planted in April 2017. 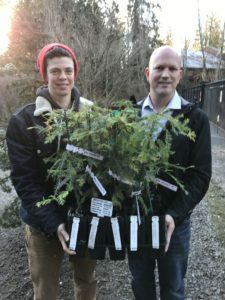 Elby Jones, left, and Kyle Endelman, arborists with the City of Sammamish Parks & Recreation, take delivery of ten redwood saplings on January 12, 2017. These saplings will be planted in Ebright Creek Park on Martin Luther King day, January 16, 2017. 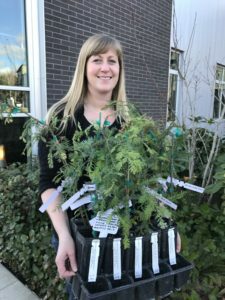 Bre Ganne, Bainbridge Island Horticulture Manager, takes delivery of ten redwood saplings for Bainbridge Island Metro Park & Recreation District on January 13, 2017. Sakai Park is the most likely candidate for their planting. 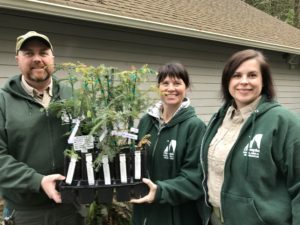 Katrina Knutson, left, Terri Reed, center, and Dan Lilley, City of Gig Harbor employees, take delivery of 25 redwood saplings on January 19, 2017. Five of the saplings will be planted in January. The remaining 20 will be planted in Grandview Forest Park on April 22, 2017 with the help of community volunteers. They will replace towering Douglas firs lost to laminated root rot disease, which redwoods are resistant to. 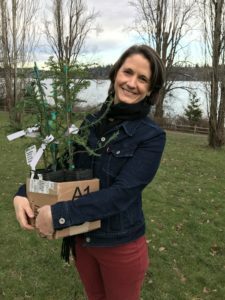 Jennifer Gordon, Public Works Operations Manager for Kenmore, accepts delivery of ten redwood saplings for the City of Kenmore. They will be planted in four Kenmore parks in late January: Northshore Summit, Rhododendron, Linwood and Wallace Swamp Creek Parks. Matt Mechler, left, Emily Meteer, center, both Open Space Stewards, and Ric Patterson, Division Manager, accept delivery of 10 redwood saplings for Issaquah Parks and Recreation on Jan 24, 2017. They will be planted in Issaquah’s Park Pointe on Jan 27, 2017. 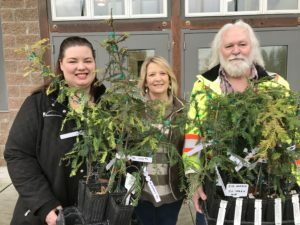 Mike Baker, left, Jennifer Gessley Gayman, center, Program Specialists, and Sylvana Niehuser, Supervisor, take delivery of 10 redwood saplings for Olympia Parks, Arts & Recreation on Jan 26, 2017. They will be planted in two Olympia parks: Priest Point and Friendly Grove in late February and early March, 2017. 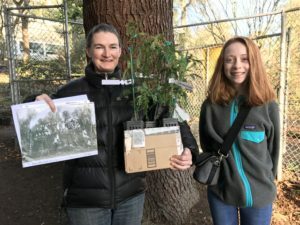 Sara Shores, Urban Forest Specialist for the UW campus, accepts delivery of 5 redwood saplings, along with Wren Wagenbach, Coordinator for Plant for the Planet. Plant for the Planet kids will help plant the trees on the UW campus on Feb 23, 2017. 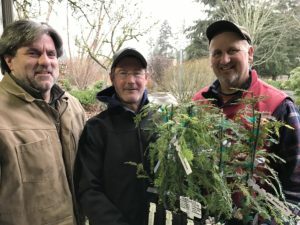 Ken Bolser, left, Mark Padgett, middle, and Mike Meteer accept delivery of 10 redwood saplings for Kirkland Parks on Feb 3, 2017. 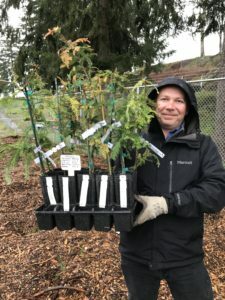 Five of the trees will be planted in Woodlands Park on Feb 14 and five will be planted in OO Denny Park on Lake Washington on Feb 23, 2017 with the help of Green Kirkland Partnership and Plant for the Planet volunteers. 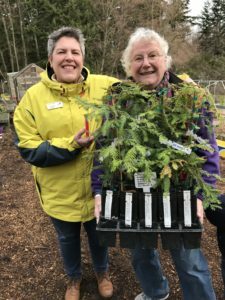 Gloria Flatterich, left, and Dode Carlson take delivery of 10 redwood saplings for the city of Mukilteo on Feb 25, 2017. The ten trees were transplanted into large pots by 8-14 year-old kids from the Seattle chapter of Plant for the Planet. 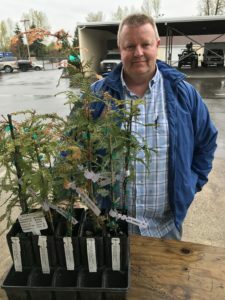 The Mukilteo Community Gardeners will care for the trees until a year or two from now when they will be moved into the nearby Japanese Gulch park after the trails are more developed. 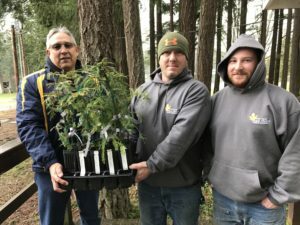 Al Frank, left, Brian Wargo, middle, and Chris Fontana take delivery of ten redwood saplings for Maple Valley Parks and Recreation on March 6, 2017. The saplings will likely be planted in Lake Wilderness Park. Tony Hamilton, Shoreline Parks Sr. 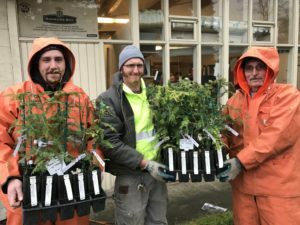 Maintenance Worker, accepts delivery of five redwood saplings for Shoreline Parks on March 7, 2017. 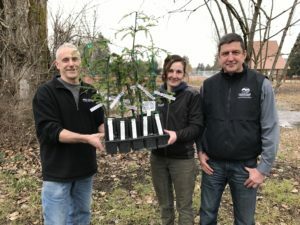 The trees will be planted at a future date in Hamlin Park in Shoreline. 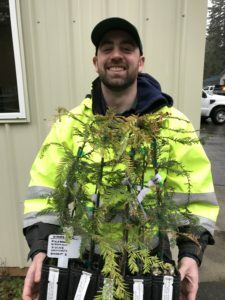 Jesse Curran, Edmonds Parks Maintenance Lead, accepts delivery of ten redwood saplings for the City of Edmonds on March 7, 2017. The saplings will be planted in Yost Park in March 2017. 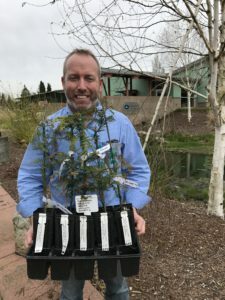 Kris Kelly, Tukwila Parks Maintenance Supervisor, takes delivery of ten redwood saplings for the city of Tukwila on March 9, 2017. Cory Roche, Community Volunteer Coordinator, takes delivery of ten redwood saplings for the city of Lake Forest Park on March 9, 2017. 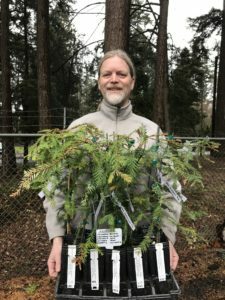 Mark McDonough, Metro Parks Tacoma Urban Forester, accepting delivery of ten redwood saplings for Tacoma Parks on March 13, 2017. The saplings will be transplanted into larger pots and then grown in the new Tacoma greenhouse until they are about 4-5 feet high and ready to be placed in a Tacoma Park. Nathan Beagle, Public Works Supervisor, accepts delivery of ten redwood saplings for the city of Mill Creek on March 14, 2017. 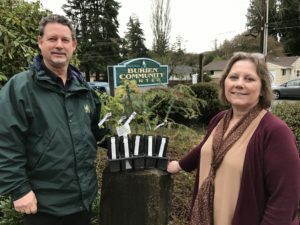 Steve Roemer and Diane Salter accept delivery of five redwood saplings for the City of Burien on March 14, 2017. 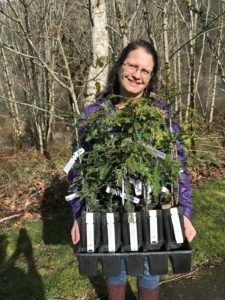 Amy LaBarge, Watershed Natural Resources Manager for Seattle Public Utilities, takes delivery on March 31, 2017, of ten redwood saplings for planting in the Cedar River Watershed. 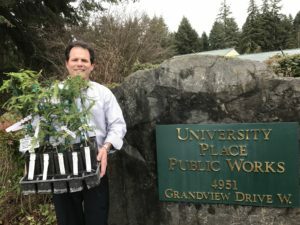 Mike Fitzpatrick, SeaTac Parks Operations Manager, accepts delivery of five redwood saplings for SeaTac Parks on April 4, 2017. 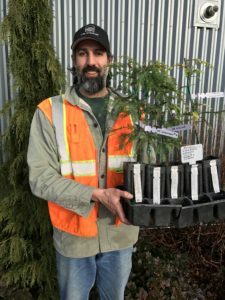 Ron Clowers, Puyallup Parks Maintenance Supervisor, takes delivery of ten redwood saplings on April 5, 2017 for planting on April 8, 2017 at Dead Man’s Pond Open Space in Puyallup.